Myself and husband John had always wanted to travel to Ireland as Johns family had left Ireland in the mid 1800s and settled in New York. My own family had come from Italy and it was our life time ambition to combine a trip to Italy, Ireland and the Catholic shrine of our Lady at Lourdes France. Our trip had been a year in the making with Sean’s company doing all the family research for us. Unfortunately my Husband John trough sickness had passed away and my daughter traveled with me instead. We contacted My Ireland Heritage as we were having major difficulty in finding Johns Family. Finnerty being an unusual name and also the fact that the records we found out may have been burnt in a fire in the Civil War in Ireland in 1922. We wrote to Sean of My Ireland Heritage and he was out standing. Although a genealogist himself he has an excellent Team member who we later met in the National archives that went trough the records as far back as 1600 without her we could never have made the Trip possible. We decided to go for the Platinum package which gave us the flexibility to have everything done for us which included Booking Flights trough Orlando with Aer Lingus this gave us a direct flight into Dublin where Sean awaited us at the Airport. We were taken to our breakfast meeting and our itinerary was given to us. We headed into Dublin City and met our Genealogist at the National Library. It was wonderful to see John Finnertys records which spanned many generations in Ireland. 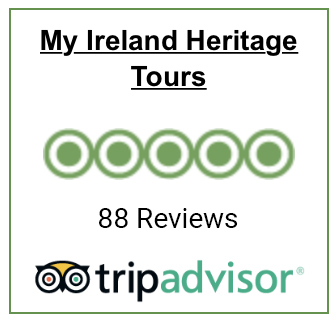 We stayed at the Knightsbrook Hotel in Co Meath which would turn out to be a fantastic venue for our up coming two day trip in Co Meath.Over the next two days we visited a 5000 Year old World Heritage site at Newgrange. At Bru na Boinne , Newgrange the sun shines into the chamber once a year on the 21st of December .To stand in this Neolitic site and to know that this site was built so long ago was one of my best feelings on this trip as the guide switched off the lights and simulated the soltice by gradually increasing the light showing us exactly what happens on that day in December. We saw many different heritage points including the Hill of Tara which was the seat of the Irish kings 3000 Years ago. We then traveled to the Town of Trim and saw Trim Castle the Largest Norman Castle in Ireland used in the Film Brave Heart. The Highlight of Trim was an Archeology dig that Sean organized for my daughter to take part in at the Black Friary 800 years Old. Finnerty is a West of Ireland name and on our Fourth day we headed west of the Shannon staying at the wonderful Ashford Castle . My Family have long admired the film the Quiet Man with John Wayne and Maureen O Hara many times my Husband had looked at this Film which reminded him so much of where is Heart lay in Ireland. Sean brought us all around the Connemara loop including Kylemore Abbey and Clifton the scenery was truly spectacular. There were so many highlights on this trip but it was surpassed when we arrived at a little Town called Ballinrobe in Co Mayo and were able to see the small holding of land that the Finnerty Family once owned. Sean pointed out that the reason we could never find our Family in Ireland was solely to do with the fact that we did not understand the fact that Finnertys originated from the Towslands in Co Mayo and I had been looking at only the records after 1864. If I had checked the Griffits Valuation of 1854 I could have identified where Johns family Parish was. We did not find any Family there but there was a local election on at the time and it was fantastic to see an Election Poster up with the name Finnerty as it is such an unusual name in Ireland. There was no feeling quite like standing at the Field where Johns ancestors had left all those years ago after the famine of 1847 to travel for a new life in the States. My daughter is interested in Archeology I laughed as she put a Small Connemara stone (and there were millions of them) in her purse to bring back as a keep sake. On our second last night we returned to stay in the marvelous Ritz – Carlton Hotel our stay here was way too short as it is set in Wicklow with some of the most beautiful scenery imanable.We visited Glendalough founded by St Kevin in 600 AD. This monastery with its High Cross and Tower is in the Wicklow mountains and it gave me great solice to know that I could finish my Trip in Ireland having achieved mine and my Husbands life time ambition of Walking in the Footsteps of his family. I cannot thank Sean and his wife enough for their hospitality . We took the full package which included a Beautifully Painting of the Townslands of the Finnertys and a manuscript of the Family history detailing the Irish History going back to the Stone age period which goes trough the ages of Irish history up to the heritage of the Finnertys and includes their new lives in America.